With much anticipation, the OMTA held our first professional development workshop last weekend. 'The Psychotherapy of Music Therapy' workshop facilitated by Sherry Campbell and Rachael Finnerty took place at the YWCA in downtown Toronto. The heritage doors at the YWCA entrance were a beautiful contrast to the modern facility indoors. Nancy's Auditorium was a wonderful space to hold our first workshop. More-so, it was an optimal weekend to be in Toronto, immersed in the summery weather as the Toronto International Film Festival was concluding with it's last films and events of the year. We hope our registrants who came from farther away were able to enjoy the city after the conclusion of the workshop at 12:00pm. The workshop began with some coffee, tea, bagels, muffins, and fruit. Beverages and snacks continued to be enjoyed throughout and especially during our brief break to stretch and refocus. As Sherry Campbell and Rachael Finnerty began the workshop, it was evident that they were well matched facilitators. Both coming to the table with years of experience in their respective fields, helped to provide workshop registrants with practical examples and useful group exercises. 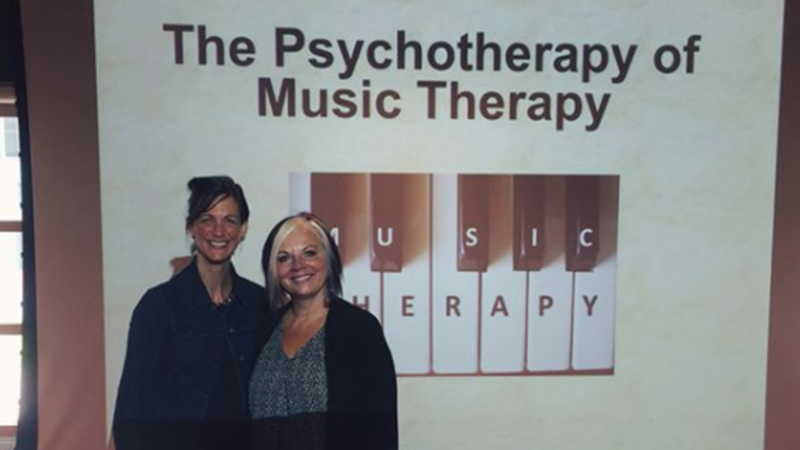 Sherry and Rachael brought the worlds of Psychotherapy and Music Therapy together in a comprehensive and engaging manner, answering questions from registrants of varying professional backgrounds. We'd like to tell you more about this workshop, but don't want to give too much away as it is being facilitated once more in Hamilton this coming weekend on September 23rd! We look forward to seeing you there. Thank you to our excellent OMTA speakers and to our registrants who spent the morning learning together, networking, and growing as professionals.